One hour a week can make a lifetime of difference. It may not seem like much – but just 60 minutes with volunteer tutors can help Mercy Home’s young people catch up in school, build their confidence and fulfill their academic potential. Tutoring is an integral part of our volunteering program. These volunteers spend an hour each week with our kids during the school year, helping them with homework and encouraging positive academic habits. For our young people, simply having someone who listens and cares whether they do their homework can make all the difference in the world. Visit our Tutor Portal for calendars, resources, surveys, and more. As a tutor at Mercy Home for Boys & Girls, you will be asked to meet weekly, on the same night each week, with your assigned youth during study time to work on homework, academic skill building, and life skills. 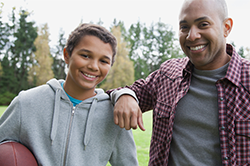 If your assigned youth is not available, you will be asked to work with another youth who has homework or is in need of support during study time. Often, tutors ask to only work on a specific subject with youth. While we take these requests into consideration for pairing purposes, overall, we cannot guarantee that you will be working on the subject area that you request. Due to the nature of middle and high school coursework, a youth’s homework may be unpredictable from one night to the next. As their tutor, we ask that you put forth your best effort helping the youth with the content, and teach them how to problem-solve when the material may be difficult. Be at least 18 years of age and have a high school diploma or GED. Have availability on the same night each week, for one hour, during the school year. Feel comfortable directing or redirecting a child to stay on task. Be knowledgeable in multiple academic subjects. Commit to completing projects with youth within a prescribed amount of time. Be at ease working with at-risk young people. Thank you for your interest in becoming a Mercy Home tutor! Our volunteer tutoring program is currently full. Please check back during the summer of 2019 to apply.